Is accounting data any use (for tax)? From the Tax Justice Research Bulletin 1(6). Two TJN stalwarts from the accounting side – one an academic, Prof. Prem Sikka, and the other practitioner-turned-campaigner, Richard Murphy – have come together to address the prickly question of whether accounting data can actually be part of the solution to the corporate tax base erosion and profit shifting of multinationals. 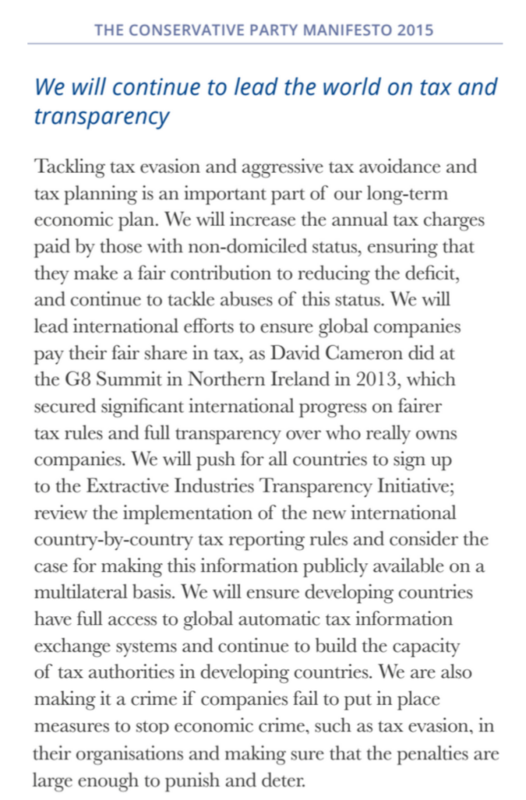 A little background: TJN started up in 2003 with a project to promote country-by-country reporting by multinationals (notably, Richard’s draft standard), as a major transparency tool to limit tax abuse. Since then this esoteric proposal has moved steadily from the extremist fringes to centre stage, with the 2013 meetings of the G8 and G20 directing the OECD to produce such a standard for global use. The tendency, conscious or otherwise, has been to assume that accounting data is accurate (though not necessarily addressing the right things), and at least broadly consistent across jurisdictions. As such, it can provide the basis for powerful measure such as country-by-country reporting (for both red-flagging by tax authorities, and holding to account by civil society). But if there’s one, top line message from the new Sikka & Murphy (2015), it’s this: accounting data does not at present provide a good basis for this greater understanding of tax. Rather, accounting data not only provides a means by which tax positions can be obscured from view; it also provides an additional vector by which tax positions can be manipulated. If your business is looking for an accounting firm in NYC to look after their money and stay legal, there are plenty of options available to you. How so? The abridged Table 1 gives a sense of it (scroll down or click for larger version). The differences around the world in accounting treatment for tax purposes are manifold and fundamental. The opportunities are legion for multinationals to exploit differences in national treatment, in order to achieve preferred global tax outcomes. Even more than usual, this summary is nowhere close to doing justice to the deep and rich set of questions that the paper raises. It’s a difficult paper, technically challenging in more than one way and requiring the reader to think well ahead. And it’s an important paper. We may not hear much about it for a while, but it wouldn’t be at all surprising to see it being referred back to as a foundational piece of problematisation in years to come. First, the OECD standard for country-by-country reporting is pretty good – probably all that could have been hoped for in the context of a process designed to defend arm’s length pricing. will never be made public. These deliberately inserted weaknesses mean that most tax authorities (especially but not only those of developing countries) will not receive timely data (i.e. within the tax year under investigation) for most of the MNE affiliates in their jurisdiction; and there will be no greater possibility of civil society holding tax authorities or MNEs to account. In addition, the erosions of the standard mean there will be no central repository or access mechanism for the data. This means that the OECD has, in effect, agreed to fail to meet its commitment under BEPS Action Point 11 – which requires the establishment of a baseline for the extent of profit-shifting, and the tracking of progress over time. The very good team working on BEPS 11, who have comprehensively shown how no existing data can do the job, appear to have been completely undermined. Regardless of what the Treasury Department agrees to as part of the BEPS project, Congress will craft the tax rules that it believes work best for U.S. companies and the U.S. economy… We expect that as we move forward on U.S. tax reform, U.S. tax policy will not be constrained by any concessions to other nations in the BEPS project to which Congress has not agreed. It is the specifics which are most revealing. While there are passing references to rules on permanent establishment and controlled foreign companies, the bulk of the text refers to concerns over country-by-country reporting. Some recent press reports have indicated that the Treasury Department believes it currently has the authority under the Internal Revenue Code to require CbC reporting by certain U.S. companies and that Internal Revenue Service (IRS) guidance on this reporting will be released later this year. We believe the authority to request, collect, and share this information with foreign governments is questionable. In addition, the benefits to the U.S. government from agreeing to these new reporting requirements are unclear, particularly since the IRS already has access to much of this information to administer U.S. tax laws. Therefore, we request that, before finalizing any decisions, the Treasury Department and IRS provide the tax-writing committees with a legal memorandum detailing its authority for requesting and collecting this CbC information from certain U.S. multinationals and master file information from U.S. subsidiaries of foreign multinationals. We also request that you provide a document: (i) identifying how the CbC reporting and other transfer pricing documentation obtained by the IRS on foreign multinationals operating in the United States will be utilized, and; (ii) providing the justification for agreeing that sensitive master file information on U.S. multinationals can be collected directly by foreign governments. In the event we do not receive such information, Congress will consider whether to take action to prevent the collection of the CbC and master file information. The push is on to prevent even the OECD’s now limited, and probably unworkable mechanism to provide CbC information to non-US tax authorities. 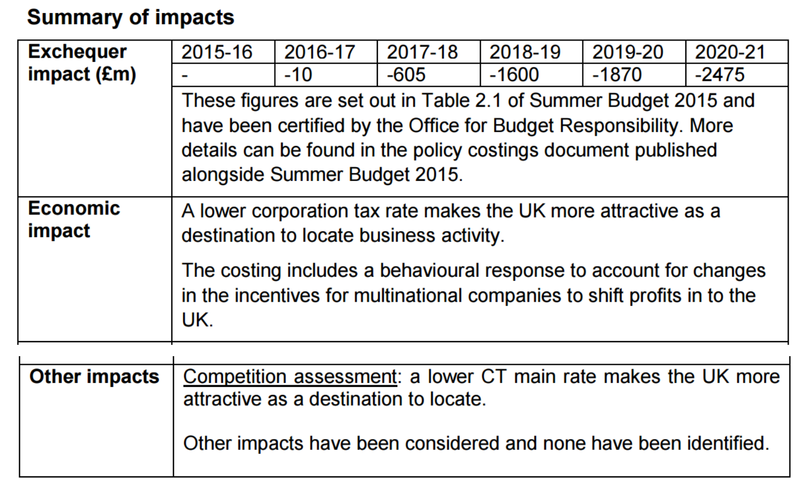 Meanwhile… the European Commission’s repeatedly trumpeted new package on tax avoidance has been leaked, and falls substantially this side of impressive. On CbC in particular, prevarication around public data continues – now with a proposed consultation. Similarly, the UK government reiterated at a conference on Friday its manifesto commitment to consider the possibility of public CbC. The European Parliament will debate the issue again on 7 July, with a possible vote to follow, and so this now becomes a major test. 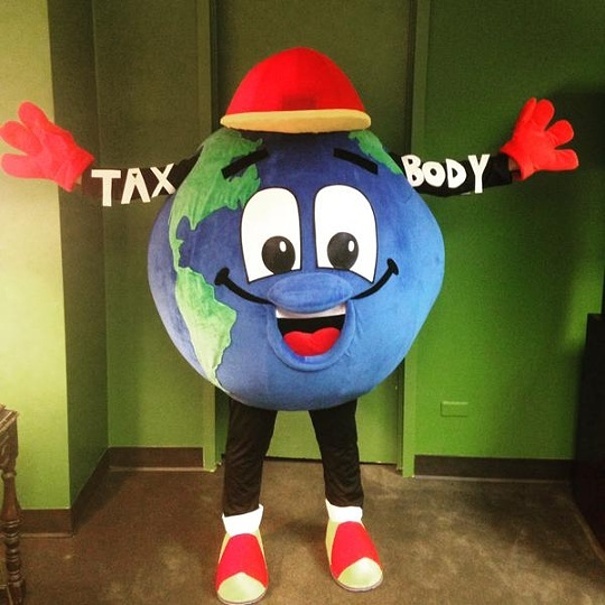 Finally, it seems that public CbC has been excised from the latest draft of the draft Financing for Development text for the UN conference to be held in Addis, in July, leaving a line on CbC for tax authorities which adds nothing to the OECD position. Sigh. Is this the end for hopes for CbC as a meaningful international transparency and accountability measure? I don’t think so. What has already been achieved, lest we forget, is the overcoming of what was always presented as the greatest obstacle: compliance costs. Aside from the possibility of US withdrawal, the OECD standard pretty much locks in the collation of the necessary data, by more or less all MNEs worldwide. The claims around costs were always inflated (who remembers one of the big four accounting firms suggesting it could add 25% to their bill? ), and so once the political tide turned the objection did not hold much water. And this is why, of course, the US letter reflects a shift towards the real underlying issue: an objection to transparency itself. An interesting though unexpressed implication of the concern is that US MNEs are apparently willing to operate in multiple jurisdictions where they would not trust the authorities with even quite basic data about their global operations. 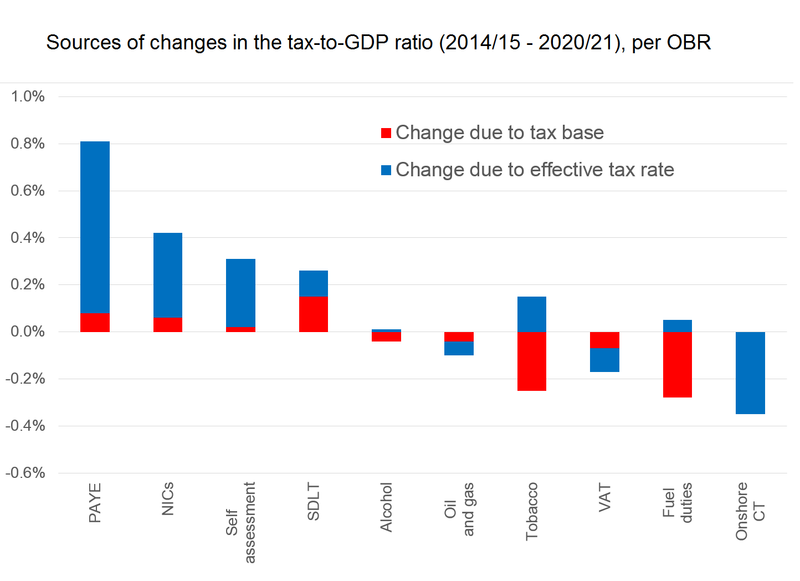 An alternative view, of course, is that US MNEs are aware of the potential for such data to lead to material changes in their effective taxation rate, in multiple jurisdictions and perhaps at the global level too. What happens next in the politics of country-by-country? Are we approaching that point where the anti-transparency lobbying has been so successful that supporters should give up? Or once this becomes clear in practice, might one or more host countries simply demand CbC data directly, starting the crucial leak in the dam? Such a move might well circumvent the OECD caveat around not using the data for formulary apportionment, which would open up all sorts of interesting further possibilities. Or will the EU resist the lobbying and go for public CbC? This would not only set a standard for others, demonstrating the absence of armageddon-level side-effects and also undermining any ‘competitive’ arguments for opacity. One way or another, the current period is likely to mark an important turning point in international tax transparency. The weakening of the OECD standard in practice has been a resounding counter-strike against transparency. The question is whether that remains the story – or if it is overturned at the European level, or incrementally by individual countries. When we look back, might today be the day that momentum swung decisively against current international tax rules? An independent commission made up of leading international economists, development thinkers and tax experts (see graphic) has called for a radical overhaul of international rules for corporate taxation. Trento, IT – Today, the Independent Commission for the Reform of International Corporate Taxation (ICRICT) launched a global declaration calling for an overhaul of the outdated international corporate tax system and demanding broad, sweeping changes in the current rules and governing institutions. The declaration will be discussed later today by a panel of ICRICT commissioners at the Trento Festival of Economics in Trento, Italy beginning at 5pm CET. I can only recommend reading the full piece, but a few points stand out. Unitary taxation: States should ‘reject the artifice’ of current separate accounting, and tax MNEs as a single unit, apportioning profit among the jurisdictions in which they operate according to the relative scale of their economic activity in each. 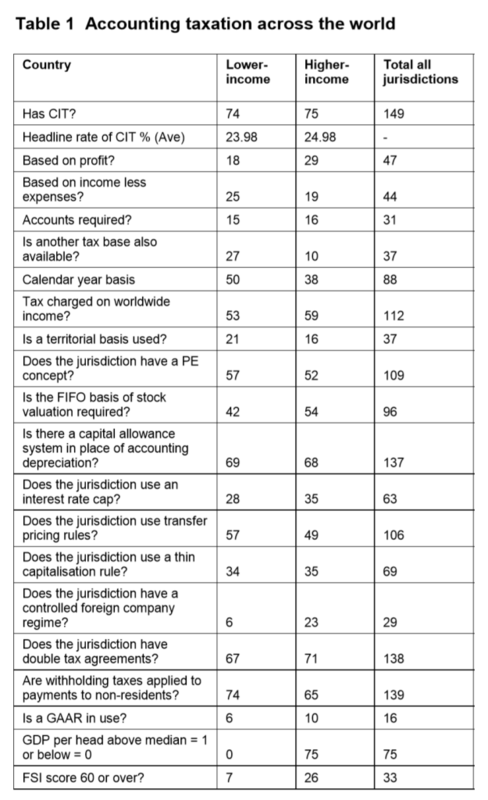 Public country-by-country reporting: States should make country-by-country reports (of MNEs’ economic activity, profits and tax) available to the public within 30 days of filing. Public beneficial ownership: states should include the names of ultimate beneficial owners (the warm-blooded type) in public corporate registries. Following the IMF paper showing how developing countries appear to lose around three times as much revenue as OECD members (1.7% of GDP, or more than $200 billion), the pressure is really on the BEPS process to deliver wider progress. At present, despite the best efforts of OECD staff working on Action Point 11, it remains unclear if the final BEPS recommendations will include even sufficient transparency measures to allow the tracking of progress. Politically, it seems that there was a victory before BEPS began for those who did not wish to see the rules opened up more widely; and some further success within the process, not least in terms of preventing (thus far) public reporting of country-by-country disclosures. But if leading opinion continues to sway towards seeing the current approach as part of the problem, and the resulting process opens up the entire basis of international tax rules, it may turn out to have been a pyrrhic victory indeed. Full disclosure: TJN is one of the organisations that helped to establish ICRICT, and I’m a member of the preparatory group – but nobody should imagine the commissioners have anything but carefully developed personal views on these issues. This issue looks at a fascinating thesis on the different people and organisations that influence the OECD revision of corporate tax rules; and a new analysis from the IMF on the scale of corporate profit-shifting, with particular attention to developing countries’ revenue losses. The Spotlight falls on the Financial Secrecy Index, which has just been published in Economic Geography. Just one thing to flag this month – the imminent launch of the report of the Independent Commission on Reform of International Corporate Taxation (ICRICT). I can’t say for sure what Joe Stiglitz and colleagues (economists, tax folks and others) from around the world will have made of their analysis of current tax rules, but it can only be useful to have a high-level, critical expert intervention. Those closed circles of tax professionals may be useful for channeling a certain policy convergence, but perhaps less so for the kind of wider thinking that may be needed. As ever, submissions for the Bulletin, including musical offerings, are most welcome. 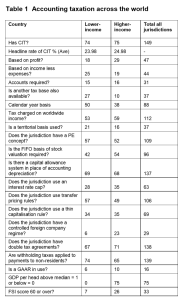 Tax professionals: Who makes the international rules? From the Tax Justice Research Bulletin 1(5). Last month, TJRB 1(4) looked at the OECD’s review of research on base erosion and profit-shifting (BEPS) by multinational enterprises (MNEs). That review revealed a dearth of findings in a number of areas, as well as broad consensus on the importance of the problem. Untouched in that review, and little researched in generally, is the process by which policy on BEPS is made. The historical record, back to the League of Nations and beyond, has been laid out by Prof. Sol Picciotto. Sol, one of our senior advisers, now leads the BEPS Monitoring Group, the hub for technical submissions to BEPS from civil society. And the BEPS process itself has now been subject to a detailed process analysis, in a seriously impressive Copenhagen Business School Master’s thesis by Rasmus Corlin Christensen. The main focus is on BEPS 13, which deals with transfer pricing documentation including country-by-country reporting (CBCR), and the findings reflect many interviews as well as analysis of submissions and consultations. The summary of literature, and detail of the methods, are well worth the time. Figures 1 and 2 show the simple range of submissions to BEPS 13, in terms of organisation type and geographical origin. There’s little surprise to find that less than 10% of submissions came from academia and civil society; and even less from South America, Africa and Asia combined. 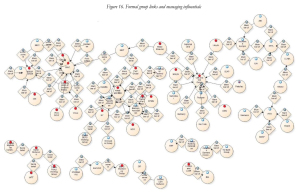 The analysis goes to a much more detailed level, tracing the paths of leading individuals in the process, identifying ‘professional competition’ as a key factor, where “influence in highly technical policy discussions is contingent upon expertise (being able to speak authoritatively) and networks (being listened to)… I distinguish two types of influential professional: career diverse professionals (“octopuses”) and well-connected specialists (“arrows”). 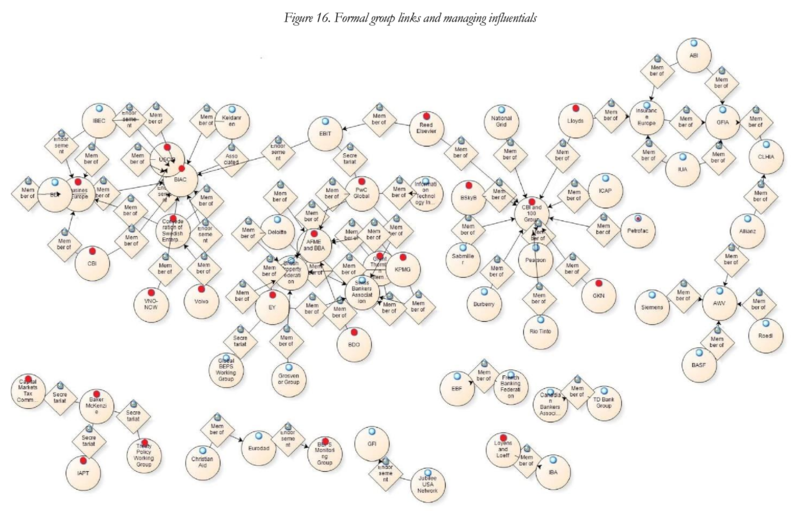 The former are influential because of their varied expertise, the latter because they are respected through key tax/transfer pricing networks.” In figure 16 (click to expand, as ever), the red dots indicate organisations with a ‘managing professional’ who is influential in the process. Finally, the significance of access to the right expertise and networks is visible in another articulation of professional competition in BEPS Action 13: lobby centres. Lobby centres are specific interest groups where different professionals and organisations collectively engage the policy process, spearheaded by one particular professional, who most often is influential. Peripheral professionals and groups without access will use this lobbying strategy to leverage the expertise and networks of influential professionals. This strategy highlights the importance of being able to access the right professional expertise and networks in order to make engage successfully in policy debates. However, this importance is not sufficiently recognised by the interest group literature, which emphasises organisational finances or issue attributes.